It always comes out of the blue. And once it happens, you can never take it back. It’s called dooring. A treacherous opening of a car door exactly in the trajectory of your ride. There’s no way around it, and you can’t do much about it. So you just grit your teeth and expect the worst. Not many things are harder to predict than a driver opening the door of a parked car at the exact time you’re passing it. Statistics on the topic are rather scarce, as the police in most countries usually classify this kind of accident simply as a non-specified collision of a cyclist and a car. In some places, however, dooring’s been brought into focus, and it’s turned out that it can’t be shrugged off. 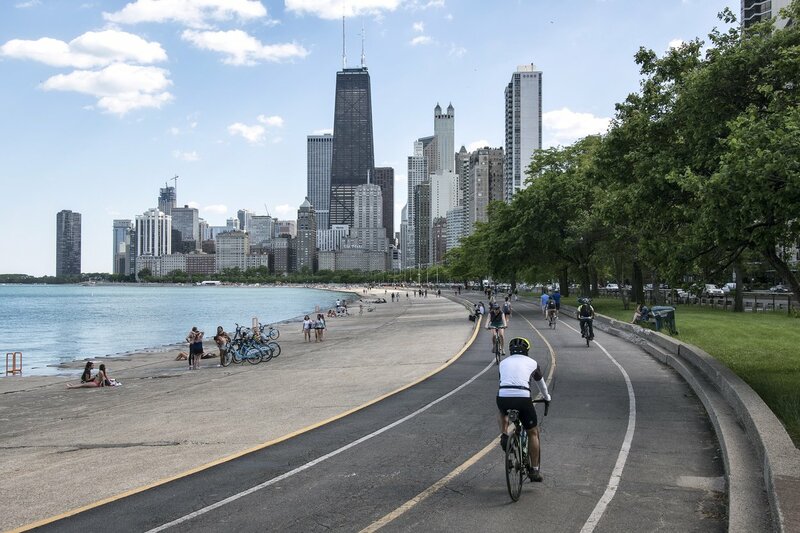 In 2011, for example, Chicago registered 344 injuries of cyclists who crashed into a sudden obstacle created by an unexpected opening of a car door. Dooring thus made for 19.7%, or almost a fifth of all cycling injuries. In 2003, dooring was the cause of 11.9% of all cycling injuries registered in Toronto, while 8% of all serious injuries of London cyclists were the result of a collision with a car door. Dooring claimed the same percentage of victims also in Victoria, Australia, between 2006 and 2010. According to experts, dooring injuries rank among the less dangerous ones compared to other kinds of accidents, but they shouldn’t be ignored. Dooring can kill too. In New York City, dooring accounted for the deaths of 7 (i.e. 3%) out of the 225 cyclists killed in total from 1996 to 2005. In London, dooring claimed the lives of 3 people between 2010 and 2012. As a result, car manufacturers don’t underestimate the situation. Where people are failing, advanced technology could offer help in the future. According to Robert Šťastný from ŠKODA, the problem could be solved in the future thanks to radars similar to blind spot monitors. 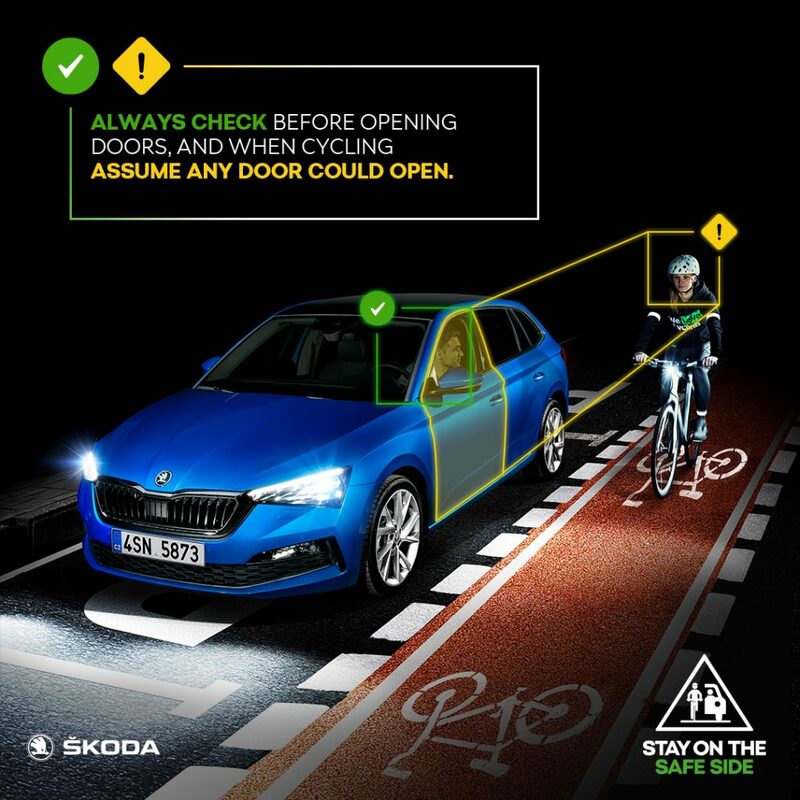 Early warning systems should be able to alert the driver to a cyclist coming from behind, and to warn them not to open the door. In many countries, drivers are bound by the 1968 Vienna Convention on Road Traffic. Article 24 of the Convention prohibits opening of the door of a vehicle, leaving it open, or alighting from the vehicle without having made sure that to do so cannot endanger other road users. If a careless driver does any of these things after all, it can be a problem even for a passing car, but in such a case, the biggest harm will probably be some crumpling of metal. In contrast to that, cyclists are in much greater danger. Cyclists are often advised to watch out. That’s easy to say! But scanning rows and rows of parked cars, often with tinted windows, is like looking into a crystal ball. The best piece of advice is to keep a safe distance of 1.5 metres. It may seem like the perfect solution, but considering the standard width of most traffic lanes, which is 3 to 3.5 metres, the cyclist would ride in the middle of the lane, blocking all the cars behind them. Needless to say, this would unleash a whole lot of anger from the drivers and a tsunami of honking. “A cyclist is only allowed to overtake a parked car if they are sure that the intended manoeuvre can be completed safely,” says Jiří Polomis from BESIP, a Czech association which campaigns for better traffic safety. He further points out that while keeping the safe distance of 1.5 metres, the cyclist must always give way to oncoming traffic. At the same time, they must behave in a way which doesn’t endanger or unreasonably limit other road users. So what is the solution? Traffic experts emphasize prevention and education. Every driving school graduate should get in the car with the automatic routine of glancing in the rear-view mirror to look for cars, motorbikes, and cyclists coming from behind, and making sure by looking over the shoulder before getting out of the car. This is part of what we call the Dutch Reach, which advises both drivers and passengers to open the door with the far hand. Keeping with this rule, drivers from European countries with the steering wheel on the left grasp the door handle with their right hand. This movement will inevitably make them turn their head and check the situation directly behind the car. There had been lengthy discussions about whether this manoeuvre really works or whether it’s just a wishful thinking of its propagators, but in the end, its contribution to cycling safety was proven on the seventh International Cycling Safety Conference held in Barcelona in October 2018. On the conference, a research team from the University of Nottingham led by David R. Lang presented their study. The research involved ten volunteers who used both methods to open both the driver and the passenger door in various conditions. According to the calculations of a device called EdTracker, when using the far hand, the volunteers’ reactions to the events going on behind the car were faster, which was also confirmed by the participants themselves independently on the device’s records. Not only does the Dutch Reach make you turn your head around, it also only enables you to open the door just a crack at first, which will give you a view of the area behind the car unobstructed by the B pillar. Even though people in the Netherlands don’t call it Dutch, the reach is a standard part of the Dutch driving school curricuIum. Apart from that, it’s also tested in the final practical driving test, which increases the chance that the drivers will remember it. Jiří Polomis from BESIP adds that drivers should inform their passengers of this obligation and check to a reasonable extent in what way the passengers get out of the car. “This primarily concerns children,” says the traffic expert from Prague. In March 2018, Berlin initiative ‘Berlin nimmt Rücksicht’ (Berlin Is Considerate) launched a project called ‘Rücksicht mit Rückblick’ (Consideration with a Look Back). As part of the campaign, several tens of thousands of stickers were made, saying that when opening a car door, a simple look back can save health and lives. The stickers were distributed among drivers to be stuck in cars and remind the drivers of the importance of taking a look before getting out of the car. On the other hand, cyclists were advised to use lights to improve their visibility and to keep a distance of at least 1.5 metres from parked cars, even if they should ride in the middle of a trail, path, or road. To tell the truth, the biggest wave of public education took place in the Netherlands in the 1970s as part of the protest movement Stop de Kindermoord (Stop the Child Murders), which emerged as a reaction to more than 500 children killed in traffic in the country in just one year. Following this project, the Netherlands built new cycle paths and underwent other urbanistic changes to make its cities as safe as possible for all, including cyclists. 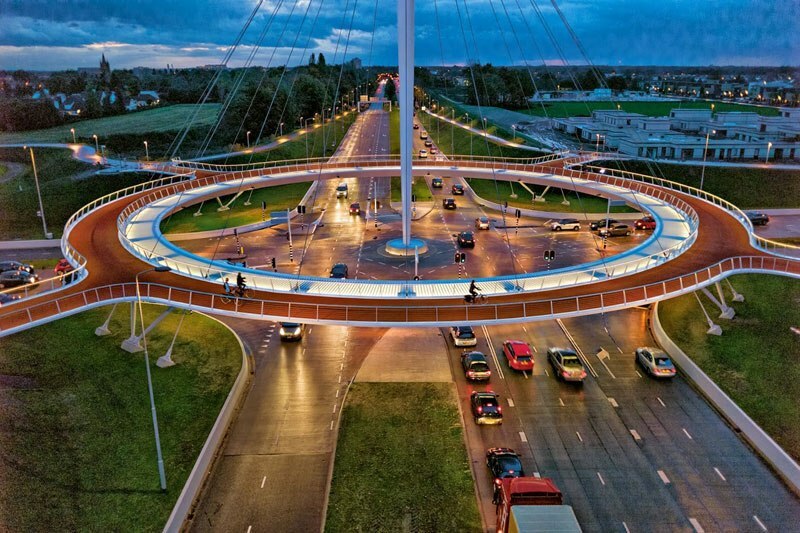 The Dutch have built an elevated roundabout just for bikes. Improving infrastructure, building new, separated cycle paths, stricter education of drivers and harder tests – all of these combined helped decrease the number of casualties on the Dutch roads. Together with Denmark, the Netherlands became an example to follow for the rest of the world. That’s probably why the habit of opening the car door with the far hand was termed the Dutch Reach in the New York Times. The name became established very fast and today it’s used in most countries – including the one you live in, probably. So next time you open the door, will you remember the reach?